The use of electricity can generate hot surfaces or sparks which can ignite an explosive atmosphere. An explosive atmosphere could be present in a variety of different places including paint spray booths, near fuel tanks, in sumps, or many places where aerosols, vapours, mists, gases, or dusts exist. Areas where it is possible that an explosive atmosphere may exist must be treated differently from other areas. The Dangerous Substances and Explosive Atmospheres Regulations 2002 (DSEAR) requires that such areas be risk assessed before any new work is carried out in them and that measures be taken to control the risks. HSE has produced guidance on DSEAR that explains how the Dangerous Substances and Explosive Atmospheres Regulations 2002 can be complied with. Care should be taken to prevent static discharges in potentially explosive atmospheres. Measures such as earth bonding and the selection of antistatic work clothing and footwear can help to reduce the risk of static discharges. Electrical and non electrical equipment and installations in potentially explosive atmospheres must be specially designed and constructed so that the risks of ignition are eliminated or reduced. Techniques to do this include sealing electrical equipment so that the explosive atmosphere cannot come into contact with electrical components, reducing the power of electrical equipment, and de-energising electrical equipment where a fault or an explosive atmosphere is detected. Recently installed equipment should be marked with an ‘Ex’ to show it is suitable for use in potentially explosive atmospheres. All new equipment must comply with The Equipment and Protective Systems Intended for Use in Potentially Explosive Atmospheres Regulations 1996 that implements the European ATEX Directive. This requires it to be assessed as suitable for a particular explosive atmosphere type and for this to be marked on the equipment along with CE and ATEX markings. 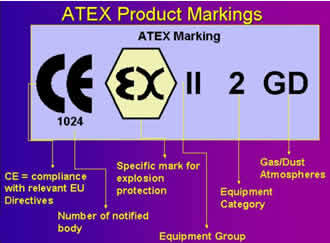 Most new equipment being sold in the UK for use in potentially explosive atmospheres must have an ATEX certificate. Equipment for use in explosive atmospheres should be regularly inspected and maintained to ensure it does not pose an increased risk of causing a fire or explosion. Maintenance of the equipment should only be carried out by people who are competent to do so. BS EN 60079 part 17: Explosive atmospheres. Electrical installations inspection and maintenance offers guidance as to the frequency and scope of maintenance required. 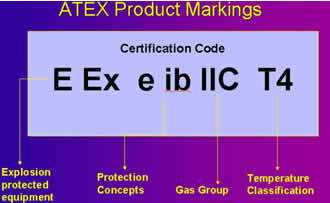 The European Commission has produced guidance on ATEX certification.